Home » VectorVest » Reiterate buy Cerillion #CER says VectorVest. The investment opportunity on offer is arguably stronger than ever. Reiterate buy Cerillion #CER says VectorVest. The investment opportunity on offer is arguably stronger than ever. By Alan Green in VectorVest on 11th July 2018 . Cerillion Plc (CER.L) is a leading provider of mission critical software for billing, charging and CRM, with an 18 year track record in providing comprehensive revenue and customer management solutions. The Company has 81 customer installations across 43 countries, principally serving the telecommunications market, but also utilities and financial services. The Company is headquartered in London and has operations in Pune, India, Sydney, Australia and Miami, USA. Cerillion’s CEO, Louis Hall, led the management buyout from Logica plc in 1999. On May 14th2018, CER published interim results for the six months ended 31stMarch 2018. The group reported 6% growth in adjusted EBITDA to £1.6m, an 11% increase in revenues to £8.4m (including a 15% increase in recurring revenues to £2.5m), and growth in back orders to £15.4m (2017: £14.7m). Net cash at 31 March 2018 more than doubled to £2.5m (2017: £1.1m), and the interim dividend was raised by 7% to 1.5p. 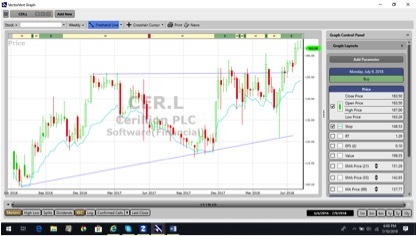 CEO Louis Hall said the number and quality of the tender processes CER are currently engaged in “is very encouraging at this point in the year, and will underpin continuing progress towards the Company’s financial goals.” “We look forward to the future with confidence and believe that prospects for long term growth remain very positive.” Separately, on May 30th2018, CER announced that it was part of the winning team that secured the “Outstanding Catalyst Business Impact” Award at TM Forum’s 2018 Catalyst Awards at Digital Transformation World 2018 in Nice, France. A weekly chart of CER over 2 years is shown above. The chart illustrates clearly a breakout of a trading range which is a very positive development for the company. The share is on a BUY recommendation on VectorVest and the technical target from the breakout and the VectorVest valuation are similar. Summary: The investment opportunity offered by this niche IT stock is arguably stronger than ever, given the excellent ratings across key VectorVest metrics. This of course is backed up by bullish fundamentals that include EBITDA growth, increased net cash and dividends driven by award winning products. These factors, combined with a bullish charting configuration, prompts another VectorVest buy rating for CER.